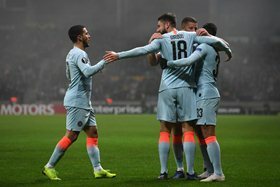 Chelsea sealed their place in the round 32 of the UEFA Europa League thanks to a 1-0 win over BATE Borisov on Thursday. Former Nigeria international Victor Moses was not in the traveling party to Belarus and it would have been his third appearance in this season's competition if he had featured. The Blues made the trip to Belarus having recorded three successive wins in this competition, and a fourth win at Borisov Arena secured their progress through to the last 32. BATE hit the post after 12 minutes. Dmitry Baga tried his luck from all of 25 yards out, and his strike beat Kepa Arrizabalaga and hit the post. It was a stunning effort and a big let off for the visitors. The hosts won a corner and Arrizabalaga was forced into action to prevent Stanislav Dragun near-post header from finding the far bottom corner. Chelsea dominated possession in the first half, but the hosts had the best two opportunities, both in the space of a minute of each other. Seven minutes into the second half, there was a breakthrough for Chelsea. The ball was worked out wide for Emerson and the left-back picked out the run of Olivier Giroud at the near post, who glanced a header inside the post from eight yards for his first goal of the season. Minutes after, there was another close call for Chelsea. A scuffed shot from distance was diverted towards goal by Nikolay Signevich, but his effort hit the underside of the crossbar before being claimed by Arrizabalaga. The goalkeeper initially got nowhere near that. The ball was pulled back for Aleksey Rios - who scored at Stamford Bridge - but the right-back sent a shot from 12 yards over the crossbar. He only had to hit the target. It was a criminal miss from the defender on the hour mark.